As a side project, and to test out basing schemes for 1/600 scale for my Korean War project, I decided to wargame the little known 1925 war between Ruritanian and Elbonia. Think of it as "Warfare During the Age of Poirot." Mostly it was an excuse to do an interwar Imaginations campaign that I could use to play battles from CS Grant's Scenarios for Wargames and paint up some FT-17's. Check them out, they are half the price of other base suppliers and do the pill shape I prefer for 20th century + gaming. No matter what shape you want, they are great, ship fast and have free shipping in the US! They are also heavily influenced by Lock anbd Load publishing's Tank on Tank rules. I will eventually get pictures of the army posted, and will play these games irregularly as the mood strikes. There is something liberating about imaginations, though. Since the end of the Great War, Ruritania has recovered fairly quickly, not having been racked by civil war as Germany has. 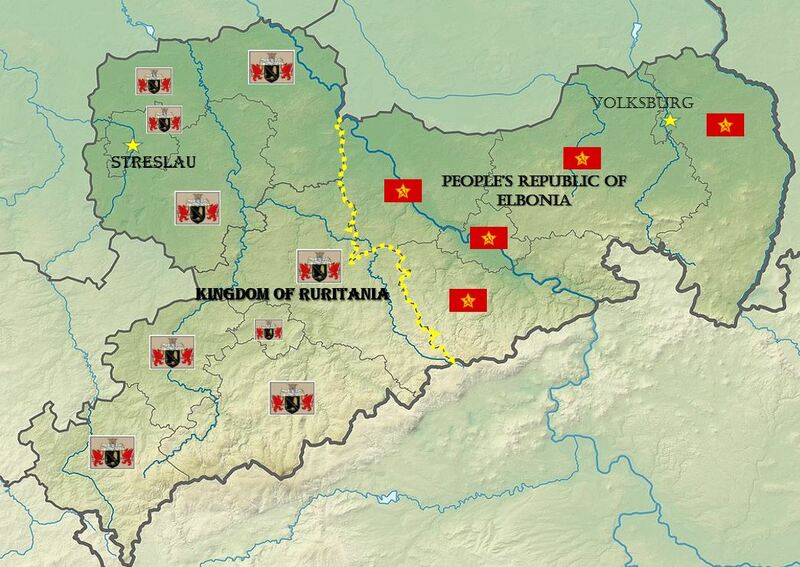 As a minor member of the Central Powers, Ruritania was treated leniently by the Allies in the Treaty of Versailles. France, in particular, sees the benefit in having a friendly, stable nation in central Europe, and Ruritania has traditional ties to France going back to the War of the Spanish Succession. As a result, the Royal Ruritanian Army is equipped primarily with French surplus equipment as the current King has sought to modernize in the face of growing threats, including FT-17 Tanks. The King is the titular head of the armed forces, but while he is a gifted diplomat, field command of the army falls to his Brother the Duke of Streslau, who commanded the Ruritanian Expeditionary Force (REF) during the Great War and served on the staff of Crown Prince Rupprecht of Bavaria. The primary security concerns of Ruritania are the bellicose pronouncements by the neighboring People’s Republic of Elbonia and fear of internal communist insurrection. Recent liberalization and the increase in the power of the Diet has diffused some of the latter, but recent border incidents have increased fear of the former. More conservative elements of the Ruritanian aristocracy have even called for stamping out the Red Menace on their borders. The Elbonians have been one of the many small minority groups that made up the Austro-Hungarian Empire since their absorption by the Hapsburgs after the Seven Year’s War. The breakup of the Empire at the end of the war has finally allowed the Elbonians to assert their independence, under the flag of a worker’s revolution. Elbonia is primarily an agricultural economy. The People's Army is equipped with former Austro-Hungarian small arms and weapons funneled from their fraternal comrades in the USSR. Officers and Commissars are trained by the Red Army and the troops are thoroughly politically indoctrinated. The Elbonians have traditionally been strong horsemen, and as a result, still field a cavalry force, which was used to great effect in the Elbonian Civil War. Currently, the Politburo in Volksburg is increasing its military readiness, both from fear of attack by the reactionary Ruritanians and a desire to free the workers of Ruritania (and Ruritanian factories and mineral resources.) Recent border clashes with the Enemies Of The People, have led to heightened readiness. They then launch their first assault on the town. The defending machine gun company has finally been destroyed, but the town is still garrisoned by an infantry company, about to be reinforced by another one. The Elbonians launch another attack. Despite attempts by the Cavalry to intervene, the Elbonian infantry is cut to ribbons by the Ruritanian artillery. The Elbonian Commisar arrests the Brigade commander and calls off the attack. There are a few rules tweaks I want to make, but it was a pretty fun game. Playing on hexes greatly sped play. I expect more dispatched from the war to arrive at irregular intervals, stay tuned! Love the background fluff and a nice little set up I must say:).